St. Norbert College art professor, Katie Ries, discusses The Moth Project, the Greening of the Bay residency idea, and writing grants. What made you decide to start Greening of the Bay and bring The Moth Project to St. Norbert College? Katie: I want to see more contemporary art in Green Bay. Especially excellent interdisciplinary art. I was also interested in bringing in artists whose work would actively engage both our immediate community and ecology. I heard about PlantBot Genetics through a colleague at a conference and their work was a perfect fit for the residency. You were awarded a National Endowment for the Arts grant in support of The Moth Project. What challenges and opportunities did the grant writing process present? Katie: We have a great resource at SNC in Sarah Ryan the Director of Grant Development. She helped me navigate the specifics of the NEA’s process. For example, one of the first things we did was to make sure the project I had in mind was a good fit for the category to which we were applying. Fleshing out the grant was a lot of fun because I got to dream big about art for Green Bay, but also to reach out to and work with some of the excellent non-profits in our area. The process of writing a grant can be intimidating for artists and staff at small organizations. Any tips you’d like to share? Katie: Start early so you can make sure to cover all your bases and get partners on board. Make sure your vision for whatever you want to do with the grant is clearly articulated and that what you’re proposing satisfies the parameters of the grant and aligns with the mission of the granting organization. This was very much a community project, with several partnering organizations hosting nighttime Moth Garden events. Do you have some favorite moments from these events? I loved seeing the Moth Gardens set up publicly in all these beautiful spaces like the Neville Museum, Green Bay Botanical Garden, and the Bay Beach Wildlife Sanctuary, to name a few. At the Neville Museum we had the good fortune of overlapping with the Wednesday evening Farmers Market. It was neat to see people drawn to the project and to see the artists Wendy and Jeff work the crowd and get them excited about moths. How do you define social practice art? Would you share an example of your own work that falls under this practice? This is something I talked about with PlantBot Genetics (Wendy and Jeff) towards the end of the residency. I describe social practice art as work that relies on human interactions and systems to make the art. Often the work is collaborative. Wendy and Jeff lean towards the term “community engaged art” (as encouraged by MacArthur Fellow and artist Rick Lowe). As an example my sculptural piece What You’ve Got relies on the audience or gallery visitors to happen. I set out a grid of seed balls and invite people to trade things for them. 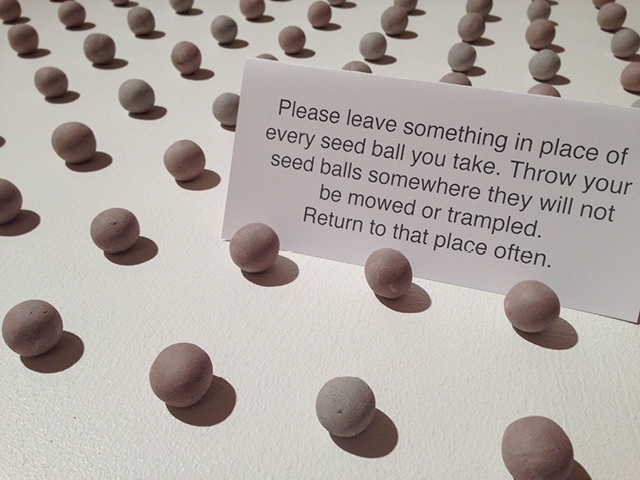 Both the objects people trade for the seed balls and the transition from the orderly monochromatic grid to the varied and colorful objects people leave make the piece. In a similar way the Moth Project involves a lot more than a single static object. It’s a collection of social interactions and objects that gains meaning and resonance through people’s participation in it. I love that about it. Thanks to Katie Ries for sharing her vision and grant writing tips. Curious to learn more? 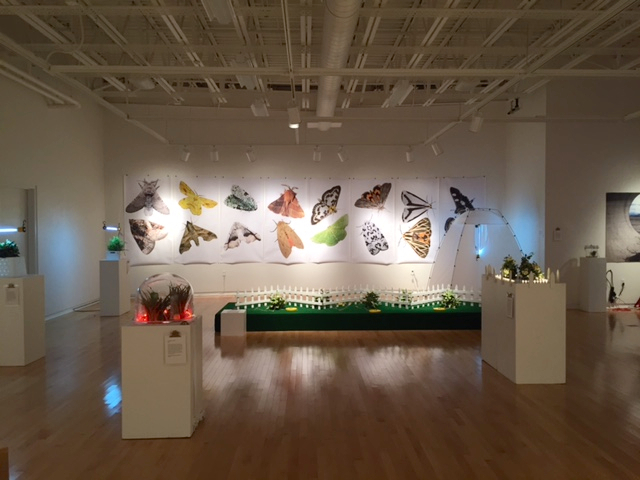 Check out PlantBot Genetics: Mothology, on exhibit in the Baer Gallery of the Bush Art Center through September 25. Saturday, Sept. 19, 10 a.m. – 5:00 p.m. SNC Day in the Galleries– Meet the artists. Listen to an inspiring talks. Make art.